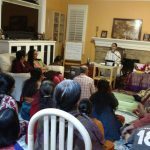 A satsang was organized at the residence of Mrs. Geeta Padaki and Shri Sanjay at Lexington MA on the evening of Friday, March 2, 2012. 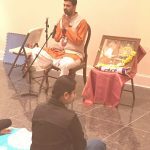 Shri Poornimaji rendered a wonderful discourse on ‘Guru Krupa Vilasam’ – the compassion of the Sadguru. 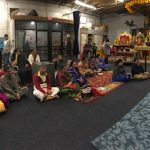 In spite of it being a snow-filled week with temperatures below freezing point, more than 30 devotees had come from various parts of the city to attend the satsang. 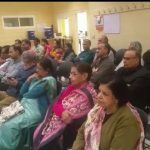 Shri Poornimaji welcomed the group and spoke on the beauty of Bhagavata Dharma. 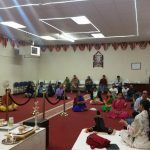 She quoted how the Dharma was so simple that one can even ‘run’ – tread on this path with closed eyes and be assured of not slipping – for it is grace – grace of the Lord – grace of the Guru – and not not our mettle, that takes us forward. She described how fortunate one should be to have the Sadguru in his/her life, who shows the beautiful path of Bhagavata Dharma and Nama Sankirtan. The Satsang concluded with Mahamantra Kirtan. Shri Sanjay and Smt. 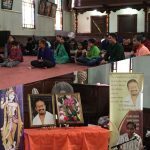 Geetha Padaki arranged for this beautiful satsang.